Department of Art | FSU Alumni and Instructors Unite in Studio, Creating a Series of New Events in Gulfport, Florida. Home » News » FSU Alumni and Instructors Unite in Studio, Creating a Series of New Events in Gulfport, Florida. FSU Alumni and Instructors Unite in Studio, Creating a Series of New Events in Gulfport, Florida. For the past year, FSU Art BA ’10 Kaitlin Crockett and former FSU printmaking instructor and SCAP Resident Artist Bridget Elmer, have been running their studio practices Oma Darlin’ Press and The Southern Letterpress, respectively, in St. Petersburg’s neighboring city of Gulfport. Both produce unique handmade paper works, host artists and events, and work the local markets and shops. On their one-year anniversary Bridget and Kaitlin welcome three new artists into the space: FSU Art MFA ’12 Chalet Comellas MFA, former FSU ceramics instructor and FSU Art BS ’00 Lyman Edwards, and FSU Art MFA ’12 Christina Poindexter. 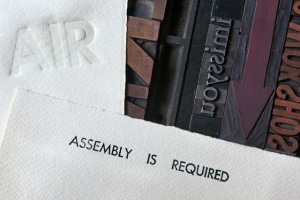 In celebration of this new connection they invite the public to experience and participate in the beginning of a series of art events entitled Assembly Is Required (AIR). Taking place on September 27th, this date not only marks the addition of new artists and the one-year anniversary of the studio space; it is the birthday of two of the artists! Please join and be a part of the celebration! There will be locally crafted beers on hand by Cycle Brewing and Peg’s Cantina. And there’s a very good chance that cake will be involved. The event begins at sunset.